When dividing retirement plans in an Illinois divorce, it is not enough to say that “the husband’s and the wife’s retirement funds shall be divided equally.” These days, many people have multiple employers over a lifetime and often have different types of retirement plans offered by employers, so naming the plans you will divide is key. The more specific you are when negotiating a divorce settlement agreement, the less confusion, and of course, less opportunity to short change a non-participating spouse. Naming plans will help you to avoid situations where an ex claims “they intended only to divide the 401k, not the pension”, because you simply agreed to split retirement accounts down the middle. Being specific will ensure that you get your fair share and avoid costly litigation to fix mistakes. To determine what types of contribution or benefit plans that you or a spouse may have, a good place to start is by looking over statements which will typically include names such as, “ABC Company 401K Plan” or “EFG Company Qualified Pension Plan”. Another option is to contact previous and current employers’ human resources departments to inquire who administers their plans and contact him or her to get more detailed information of all accounts. Having specific information will ensure that all retirement plans are accounted for and subject to fair marital property division. If you are considering divorce, it is always a good idea to do your homework, gathering statements or other documents related to finances in your retirement accounts. An experienced family law attorney can help you get started and see you through the entire divorce process, helping you to avoid mistakes that can result in a loss of valuable benefits or unnecessary litigation. 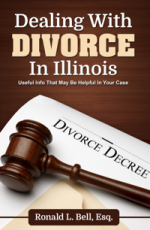 Contact the Lake county Illinois Family Law Offices of Ronald L Bell & Associates PC for immediate assistance with Illinois marital asset and debt division today.